Joker goes for broke with two new shirts this month. 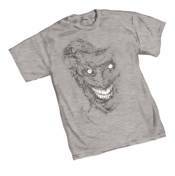 Joker: Crazy Again features a blackand white imprint on a light steel shirt while Killing Joke II, based on the art of Brian Bolland, is imprinted on a purple shirt. Say 'cheese'!! NOW AVAILABLE for sale in Canada and U.K.